Doesn't look like much, does it? Just a few hunks of wood, really. It's going to be a bass in a while. And, to be more precise about that wood, what we actually have is a hunk of nicely figured ash, a hunk of rock-hard maple and a hunk of darkest, darkest, ebony. That ash (the biggest bit of wood in the image) will form the body of the Radio Nova Rocktober bass. It's going to be finished in a 'black-burst' effect, with a clear centre, gradually darkening to a black-toned edge. I think that'll look pretty damn cool with this grain peeking out underneath. 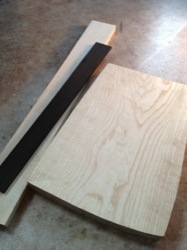 The maple will form the neck and the ebony will be slotted for a 30" scale to form the fingerboard (and to carry the black theme up to the headstock). It's gonna be handsome and no mistake but these lumps of wood are going to impart a great tone too. Looking forward to getting going on this. Check back soon for more. A proper FAQ about having a guitar or bass custom-made is probably overdue around here. I'll add it to my To Do List and, in the meantime, I'll offer this hastily cobbled together blog post in response to some of the questions I'm getting about the Super Amazing Win A Custom Haze Guitar With Radio Nova's Rocktober 500 Countown (from here on in referred to as Rocktober as that's a lot to type). Naturally enough, I've gotten some queries from people who want to know how it will all work for the ultimate winner and from those who have questions about doing the custom guitar thing in the normal, non-competition route. Hopefully this will help a little. If you think of something I haven't covered, feel free to shout in the comments and I'll do my best to answer. 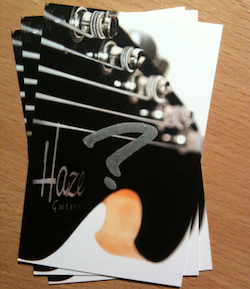 A: You can win yourself a completely custom guitar or bass. By that, I mean that you can sit down with me and we can design and specify as much or as little of your guitar as you like. Then I'll build it. A: Tune in to Radio Nova on 100FM or listen online. Call when they tell you and make a guess at what the number one song in the Rocktober 500 Countdown will be. All correct answers go in a draw to win. Q: Do you know what the number one song is? A: Nope. And if I did, I wouldn't tell you. Well, maybe for cash. Or biscuits. It's all moot though. I don't have a clue. Q: I can play a few chords but I don't have an in-depth knowledge of how capacitor value and no-load potentiometers can be used in a tone control. How can I design a guitar? A: Don't fret (guitar humour). We can talk capacitors if you like but you can just as easily chat about what guitars you think look cool or sound cool and I'll handle the science bit. Q: Can you build me an exact copy of <insert famous guitar here>? A: Not really. Legal issues aside, that sort of misses the point of a 'custom' guitar anyway. This is your chance to get something unique. Now, that said, there's no problem looking at existing guitars to garner some inspiration. Exact copies are out, though. Q: Did you really make a guitar for Joe Bonamassa? A: Are you calling me a liar? Sure did. Check it out. You can have one too if you like. Q: I want a guitar made of jelly, with a Waterford Crystal neck and pickups that can curve space-time in such a way that I can see the Big Bang. Can you do that? A: What flavour jelly? The honest answer is that I may need to advise on practical considerations as we progress through the design and specification process. I'll do my best to accommodate your craziness but it may not always be possible. Q: Ha! I've caught you, Hayes! You mean to tell me there are terms and conditions to this? A: Of course there are terms and conditions. You can check them out on the Rocktober competition page and they'll be here after that's moved on in case you need a reminder. A: It depends on the specification you want and the availability of any parts that are needed for your guitar. Custom orders are generally turned around in a few months but I'm estimating around 20 weeks for this to be safe. It most likely will be shorter but could be a little longer if you want something mental. Q: I live on a small island off the coast of Laois and I need to charter a Lear Jet to meet you for the design process. Will you reimburse me? A: Nope. You'll have to make your own way, I'm afraid. I might make you a cup of tea though and, let's face it, you'll get a snazzy guitar out of it so it's not all bad. Q: I reckon that the solid gold guitar and platinum strings I want falls well within budget. Is this ok? A: Nope. I get to assess the actual realism of costings and final value. I'm not daft. Q: I never win anything. Can I have a guitar anyway? A: 'Course you can. And for a surprisingly reasonable wad of cash. Radio Nova are doing their Rocktober 500 Countdown of the best guitar songs ever. You tune in, listen to some great songs and, when you hear their cue to call, phone them on 01 440 4100 and tell them what you think will be number 1. If you're right, you'll be in a draw to win. So, what are you still doing here? Warm up the valves in your wireless and twiddle it to 100FM or listen online. So, I told you it was gonna be good. I'm assuming that a lot of the (Irish) people that read this probably listen to Radio Nova for their fix of great, guitary music. Well, now you've got another reason to tune in. The teasers have started to air and I can now announce that I've been working with Nova to help spread guitary-goodness. A custom Haze guitar or bass. Yep, the lucky winner will get to design their perfect instrument with me and I'll build it for him or her. This will be a completely custom instrument. I'll meet with the winner to discuss and decide on specifications and then I'll hack at bits of wood and metal and strings and stuff to make their dream guitar or bass. More details to follow. For now though, if I were you, I'd turn on the radio.